February is almost here and I wanted to get this decoration made so I can put it up in my house. I made a Valentine's tree decoration to show you. 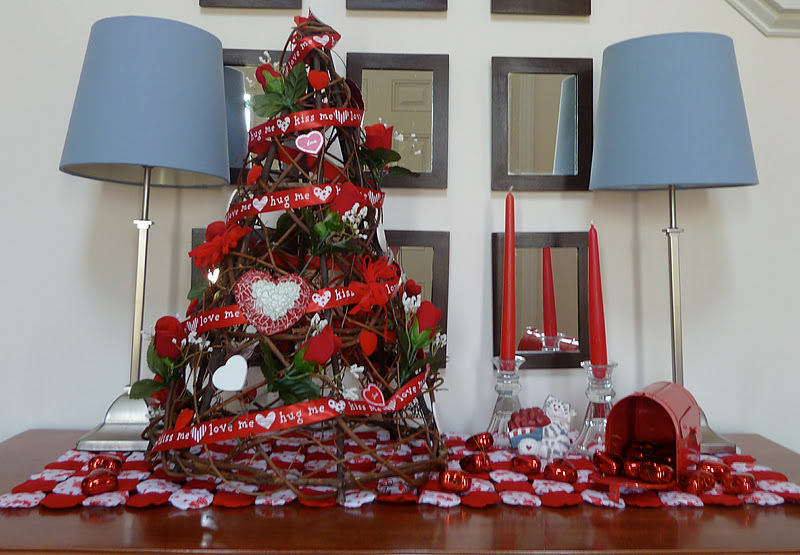 This is a very simple project using the following a twig tree, silk roses, painted wooden hearts in red and white, valentine's ribbon, red bows, and tin hearts in red and white. (Floral wire, wire cutters and hot glue gun not shown here). I wound the ribbon around the tree and hot glued it in place. Using floral wire, I tied on the red ribbons and silk roses (that were cut from the bunch using wire cutters). The wooden painted hearts were hot glued on to the tree. The tin hearts were hung on the tree because they came with hangers. The finished project is shown above. 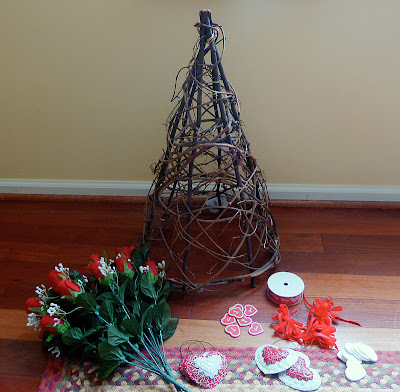 Easy quick valentine's decoration. This project was featured on Joyful Stamper's Inspire Me Fridays! See post here. Very pretty Dawn, but I wish you hadn't added chocolates - I'm currently on a diet and they are calling to me LOUDLY!! cute! Any walk through steps i can follow to do this? I will try to show more detailed steps when I make my upcoming St. Patricks day tree decoration. this is so gorgeous Dawn! I'm so glad you linked up @ Inspire Me Fridays, I'll be featuring you this week! Maria, Thank you so much for picking my project to be featured! I am so honored!